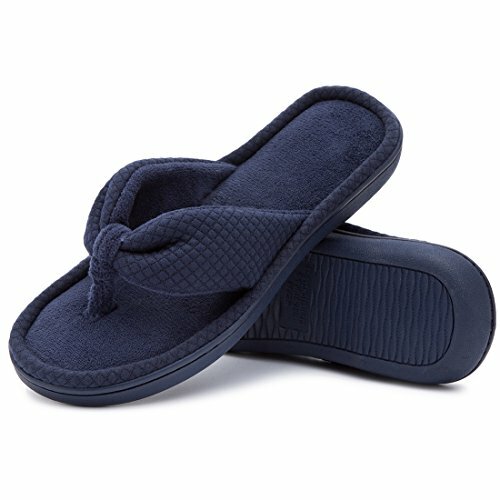 Women's Cozy Memory Foam Plush Gridding Velvet Lining Spa Thong Flip Flops Clog Style House Indoor Slippers (Medium/7-8 B(M) US, Light Navy Blue) | What Should I Say? Why Choose Our Memory Foam Plush Gridding Velvet Thong Slippers? • The newly breathable plush gridding upper together with improved 3 layers padding is really an ideal combination for these slippers, which can perfectly snug your feet and keep cushy but entirely dry wearing feeling for you. •The heightened but durable and lightweight waterproof slip-resistant sole is a great choice for indoor and moderately outdoor use if you insist. • The edge of the slippers is seam crafted, not easy to crack. The meticulous thong style knitting confirms a solid and reliable feeling while wearing them. • Podiatrist approved memory foam contours to the shape of your feet which helps reduce pressure points and fatigue. • Tell your dog that it is not a play toy. • The side seam is environmentally made through hand stitching. So, any thread ends in the sole should be cut with scissor but not pulling or drawing. Tip: Ex. : (4.5 - S); Number '4.5' refers to model's feet size. 'S' means the most suitable size of the slippers for the front feet size. SNUG THREE LAYERS PADDING: The expertly designed padding consists of one premium high-density memory foam foundation together with two levels of sponge to offer cloud-like comfort with every step you take. Covered with breathable and soft velvet upper, these slippers could wick moisture away to keep your feet refreshing and dry. ANTI-SKID & WATERPROOF SOLE: The improved durable and lightweight waterproof rubber sole is a great choice for indoor and moderately outdoor use if you insist. Anti-skid texture in the bottom gives you a real stable feeling and prevent from scratching your floor when lounging around your house. SIZE & COLOR OPTIONS: Available in size Small (5-6), Medium (7-8), Large (9-10), Extra Large (11-12). Available in your choice of Navy Blue, Pink & Gray. Due to multiple sizes and wide upper design, these stylish slippers fit most standard and wide foot sizes. Hand or machine washable. GREAT SPA & HOUSE SLIPPERS CHOICE: With these ULTRAIDEAS plush gridding velvet thong sippers, they can be perfectly worn indoor to eliminate fatigue after a long day working or accompany you to enjoy a pleasant weekend. Tactfully clog design sole offers you real much needed support when you slip them on. Wearing them post-bath or spa, you must be addicted to the greatly soothing comfort. If you have any questions about this product by ULTRAIDEAS, contact us by completing and submitting the form below. If you are looking for a specif part number, please include it with your message.